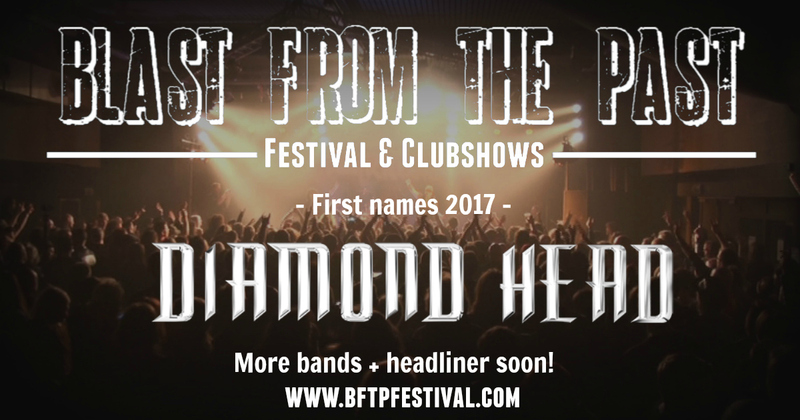 After Diamond Head had to cancel their show on Blast From The Past 2015, they’re back & with a new album! Diamond Head were one of the first NWOBHM bands and were poised for success from the very beginning. Sounds (and later Kerrang!) journalist Geoff Barton even proclaimed that “there are more good riffs in a single Diamond Head song than there are in the first four Black Sabbath albums”. Signed to MCA Records, they were hyped as “the new Led Zeppelin”, yet after two albums on that label (the latter, Canterbury, a very expensive production), they were still not playing big stages. MCA Records dropped them and they split up for the first time in 1985. They got some major recognition after Metallica covered their songs (to this day, Metallica have covered an album’s worth of Diamond Head songs), and when Lars Ulrich featured them (twice) on his New Wave of British Heavy Metal ’79 Revisited compilation. They reunited in 1991 with a good label deal and a new album featuring guest appearances by Tony Iommi and Dave Mustaine, yet success still largely escaped them.